Update: Added articles from IEEE Spectrum, Olympics smog blog link, and today's Doonesbury. A dispatch from the WaPo Foreign Service in today's carbon-based edition (A18, if you're keeping score at home) notes that In Cleanup Effort, Beijing Moved Factories to Clog Air Elsewhere. Climate Progress points out that a cover package of four articles, a news item, "Will Beijing's Dirty Air Hurt Performance? ", and an editorial (free access with registration) in last week's Science magazine on "China's Environmental Challenges", like most general media coverage, completely neglects the longer-term problem of greenhouse gas emissions and their effect on climate. Its fleet of wind turbines more than doubled in generating capacity in 2007, surging by over 3 gigawatts, according to the Global Wind Energy Council. That's less power capacity than China's coal sector adds per week, but it's enough to make China the third-fastest-growing wind market worldwide (behind the United States and Spain) and propel it to fifth place in the Global Wind Energy Council's annual capacity rankings (ahead of even wind-energy pioneer Denmark). The June issue contained the article, "How to Build a Green City", about the plans for the development of Dongtan, "the world’s first eco-city" on an island off Shanghai. Here's an interesting link from the smogo-blogosphere: The HoChro's Sports Update blog has a special archive section just for Olympics smog. Maybe it's to make Houston's oppressive heat and humidity seem more bearable? Update: Added link to actual NOAA forecast text. Paraphrasing the old political adage, the tropical prognosticators are upping the ante on the outlook for the remainder of this hurricane season. NOAA's prediction, which was announced this morning, has raised the probability of an above-average season from 65% to 85%. The range of named storms has been bumped up by to two, to 14-18, and the number of hurricanes has been pegged at 7-10. This update follows by a few days the revisions of the Klotzbach/Gray group at land-locked Colorado State. They're on the high end of the NOAA range, calling for 17 named storms vs. 15 in the previous forecast made in June. The other seasonal parameters include (previous forecast in parentheses): hurricanes 9 (8), intense hurricanes 5 (4), named storm days 90 (80). At Weather Underground, Dr. Jeff Masters has posted Part I of his August hurricane outlook, covering Sea Surface Temperatures (SSTs). He sees continued above-average SSTs. On Friday, he's planning to cover wind shear, steering currents, and dust levels. 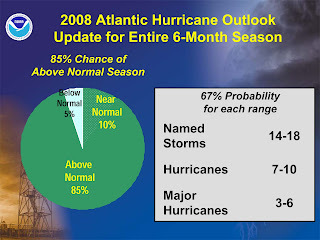 Image of revised hurricane season forecast from NOAA. Natural gas is down nearly 40% from its peak. Is now the time to buy ahead of the winter's heating bills? CNBC interviews a commodities investor today. In chapter five, Friedman describes the controversy that ensued when meteorologist Heidi Cullen tried to educate her audience about global warming. What is the best way to inform those who tune out such messages, which they believe are tantamount to “politicizing the weather”? It remains to be seen, of course, whether Friedman "gets it" on the climate issue, but preliminary indications sound like the author is promoting the thesis long supported by this Climate Capitalist: "It's the economy, stupid." No matter what the wingnuts, ideologues, and crackpots want to believe about the Big Climate conspiracy, global warming is ultimately an economic issue. 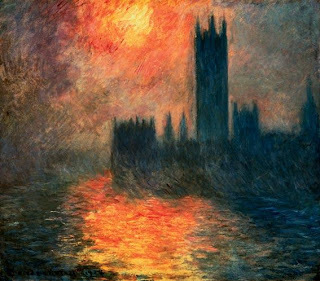 The global marketplace, if it's allowed to function without the current bias toward outmoded CO2-generating technologies, will determine that the cost of inaction is much more than the cost of attacking the problem. If you don't believe that, how's your GM stock doing lately? Here's a clue, if you don't watch such things: GM recently hit a 50-year (not a typo) low. As a promotion for Friedman's new book, the publisher is offering free downloads of the audiobook of "The World Is Flat" and a preview of "Hot, Flat, and Crowded" in exchange for signing up for their email newsletter. The offer is good only through next Monday, August 11. Today's Friedman column, Learning to Speak Climate, is a dispatch from the front, so to speak; it's an account and interpretation of his viewing of glaciers in Greenland. The previous one was about a visit to an ice research center above the Arctic Circle. Friedman earlier this year discussed climate change with the founders of Google. Last year, he was the keynote speaker at the MIT celebration of the publication of all MIT courses online through OpenCourseware. The introduction to the MIT lecture alludes to the 2003 Yale Commencement address which the Climate Capitalist attended. 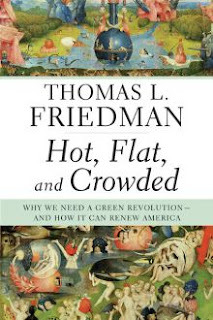 At the 2007 Aspen Ideas Festival, Friedman delivered the presentation "Green is the New Red, White, and Blue" (Part I, Part II, and Part III). The average maximum temperature at Observatory Hill of 17.2 °C was 0.9°C above the historic July average. This is now the 10th consecutive July with above average maximum temperatures at Observatory Hill. Sydney's nights were cool during July, the average minimum temperature at Observatory Hill was 8.3°C which is 0.3°C above the historic July average. Today's WaPo sports section has a report from the scene on Beijing air quality and its effects on the athletes. Sally Jenkins draws some deeper connections from the pollution issue. Last night's PBS NewsHour had an extensive report (audio, podcast, and video available online) on the causes and effects of the situation. Edouard made landfall as a strong tropical storm on the Texas coast this morning. At 7 am Central, the center of the storm was between High Island and Sabine Pass. Maximum winds were 65 mph, and tropical storm force winds extended up to 70 miles from the center. Gradual weakening is likely today as the storm moves further inland. Tropical Storm Edouard strengthened Monday evening, with maximum winds of 60 mph. It continues heading a little north of west toward a landfall Tuesday. Huricane local statements are being issued by the Lake Charles, New Orleans, and Houston National Weather Service offices. Update: At 4 pm Central, Edouard is becoming better organized, but maximum winds are still at 45 mph. The current westerly track at 7 mph is expected to turn more to the west northwest tonight. The storm is forecast to be near hurricane force by landfall in the middle of the day on Tuesday. As of 1 pm Central, the outer rainbands of Edouard were reaching the Louisiana coast. The Tropical Storm Warning and Hurricane Watch remain in effect. Maximum winds continue at 45 mph. Meanwhile, despite financial media assumptions to the contrary, Edouard's expected path through the oil rig region of the Gulf has NOT had a positive effect on oil prices. In fact, shortly before noon, prices had dropped as much as $5 to briefly under $120 a barrel in New York commodity trading. Natural gas prices also plunged sharply, as much as 7%. Shipping and some drilling and refining activities were reported affected, however. At 10 am Central Time, the Tropical Storm Warning in effect from the mouth of the Mississippi was extended westward to Port O'Connor, Texas. A Hurricane Watch remains in effect westward from Intracoastal City, LA to Port O'Connor. The circulation of Tropical Storm Edouard was disrupted somewhat overnight by wind shear. It became better organized this morning, although its maximum winds lowered to 45 mph. Some strengthening is still likely before landfall. The forward speed has picked up to 8 mph, moving westward toward the Texas coast. Images: Top, infrared satellite from HAMweather; bottom, official forecast track from National Hurricane Center. In a report early Monday, Bloomberg was already blaming a 1% rise in oil prices on Tropical Storm Edouard in the Gulf of Mexico. Update: As of 11 pm, the Tropical Storm Watch was replaced by a Hurricane Watch from Intracoastal City, LA to Port O'Connor, Texas. 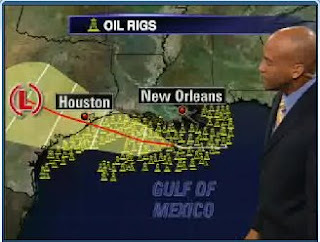 The Tropical Storm Warning was extended westward to Cameron, LA. Maximum winds are up to 50 mph. Almost immediately after aircraft reconnaissance determined that an area of storminess in the northern Gulf of Mexico had become a depression, the storm was upgraded to Tropical Storm Edouard. 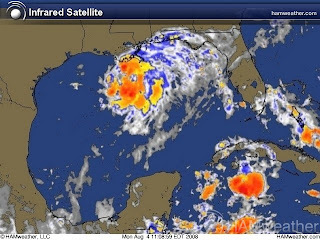 A Tropical Storm Warning is in effect for the Louisiana coast from the mouth of the Mississippi westward to Intracoastal City, and a Tropical Storm Watch is in effect west of there to Port O'Connor Texas. The storm, with maximum winds of 45 mph, is moving west at 6 mph. Some additional strengthening is likely in the next 24 hours, and the storm may be near hurricane force by landfall. Wondering about the name "Edouard"? (Yeah, we had to check the spelling, too.) See what "Unconfirmed Sources" have to say.